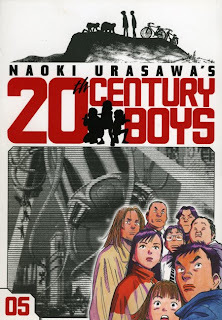 It's a very brave and interesting decision by Urasawa, just when the tension to see what happens gets greatest he jumps away from the previous story. Then we find out that it seems like the Friends won and all the characters of the early books are dead, or missing. Book 5 is quite grim and depressing and I wasn't that keen while reading it but once I got to book 6 it all gets very exciting again. You can see how Urasawa was just setting things up in book 5. New mysteries start up and I really got into it again. Some new characters turn up too like an imprisoned manga artist, who's latest story seems to have been too much like the truth. It really is a great series.